In 1988, the Daughters of the Republic of Texas gathered hundreds of old recipes from the early days of Texas and published them as A Pinch of This and a Handful of That. I have loved browsing through this collection of pioneer recipes and household tips ("Clothes which have a bad odor may be wrapped up and buried for a day or two in the ground to remove the odor" and, "To heal chapped hands, rub them with buffalo tallow"). When I spotted this recipe, I knew I had to try it. These are definitely Great-Grandmother-worthy cookies...buttery and crisp around the edges, rich and chewy in the middle, and a perfect balance of raisins, pecans, and dough. They really are some of the best cookies I've ever eaten. 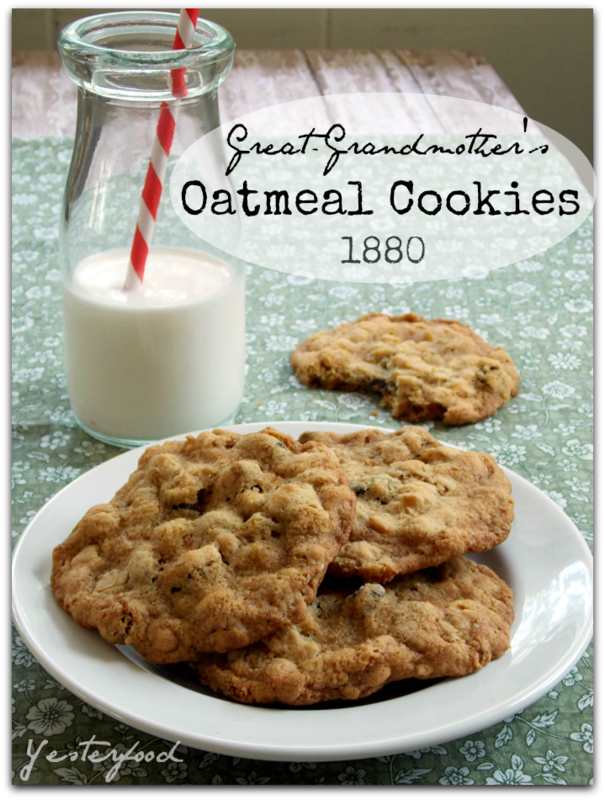 I used old-fashioned oats in my cookies because that's probably what Great-Grandmother Tenery used: quick cooking oats were not developed until the 1920s. Here are the exact instructions, as written: "Cream butter and sugar, add eggs, one at a time and beat thoroughly. Sift dry ingredients three times and add to creamed mixture with oatmeal, pecans, and raisins. Drop on greased tins, and bake in moderate oven for 15 minutes". I added: Preheat oven to 350 degrees. Although the directions did not specify, I stirred the vanilla in right after the eggs. Bake on a parchment paper covered cookie sheet for 13 to 14 minutes or until just starting to brown (the longer they bake, the crispier they get). I dropped dough by rounded tablespoon-fulls. This made about 42 large (3.5"), delicious cookies. Recipe from: Seconds of A Pinch of This and a Handful of That, 1830-1900 by The Daughters of the Republic of Texas. These cookies may have been taken to some of these fun parties! I've never used cinnamon in an oatmeal cookie recipe. I will have to give it a try. Thanks for this recipe. Hi, Natalie! Very happy to be following you back! :) Thanks for the visit! I am following yesterfood pinterest board. Your cookies look wonderful. Lisa, I'm kind of the same way; I just can't get enough of old recipes! :) I'm so glad you came by- thanks! Hi Joy. That is so cool that you have a recipe in your family that dates back to 1880! Pecans & raisins sound so good with oatmeal cookies! I make Oatmeal Cookies as well and these look delicious! I love recipes that have been handed down, or even stumbled upon. These look fabulous. I need an oatmeal recipe. Normally, I'm a chocolate chip baker, but need to test my skills on the oatmeal cookie and this one looks delicious! Saw you on the Spatulas and thought I had to check out those cookies. That cookbook sounds like a treasure. I love looking through old recipes...although they can sometimes be frustrating to use due to unusual formats and missing ingredients. But I guess that's part of the charm. I haven't made oatmeal cookies in so long. Will give these a try. Thank you for linking this week, Joy! What a wonderful cookie! Cannot wait to bake up a batch. Sounds yummy. With all those pecans and raisins you just couldn't go wrong! What a great recipe to have, from so long ago. Thank you so much for sharing with Simple Supper Tuesday! Pinned ! These look so delicious, Joy :-) Thank you for sharing at our ALL MY BLOGGY FRIENDS party ! I just love the story behind these cookies. Thank you so much for sharing. I have a bowl of fresh walnuts sitting in my dining room calling out to me to be used in a cookie recipe. I think I'll substitute them for the pecans in this one. Found you via the Thriving on Thursdays link up at Domesblissity. Great story, great recipe! I actually know Navarro County! I lived in Dallas for many years! Hi Joy, Thanks so much for sharing this recipe and it's background. These kinds of stories is what makes cooking and baking worth while. Cookies are a staple and I love oatmeal cookies - but then again I love every cookie - so I'm certainly going to make this tried and true traditional cookie. Thank you for sharing this with Foodie Friends Friday Mother's Day party. We look forward to seeing you again with another delicious recipe. What a special treat and a joy to have! Thank you so much for sharing this awesome recipe with Full Plate Thursday. Hope you have a very special Mothers Day Weekend and come back soon! Your cookies do look delicious, especially with a nice fresh cup of coffee. My daughter has found some wonderful old cookbooks at the used book store with lots of wonderful notes and instructions written in them. Amara already has her first cookbook in which she is collecting recipes she likes, my sister made it for her! Happy Mother's Day! I love oatmeal cookies and these sound awesome Joy. Pinning them. Thanks for sharing on Foodie Friends Friday. Thanks, Marlys, and thanks for pinning! :) I always enjoy Foodie Friends Friday! I absolutely adore Oatmeal Cookies! Looks delicious. Your cookies were the #1 Most Clicked Recipe from Foodie Friends Friday this week! It will be featured on Daily Dish Magazine on Monday! Recipes that have been handed down generation to generation are the best! :) Thank you so much for linking up with me this week at Tasty Tuesdays! I’ve pinned this & shared it with my followers! YUM!!! This sounds delicious. You're featured tomorrow! It's so very nice to meet you! I'm coming over from foodie friends friday. These cookies look so yummy! I hope to try them soon. I just liked your page on FB and look forward to seeing more of your recipes. I would love it when you get a chance to stop by my page. https://www.facebook.com/pages/Young-Adventures/153028528072356 Have a good evening. This looks wonderful! I can't wait to try them. Thanks for linking up with "Try a New Recipe Tuesday!" I hope you will be able to join us again this week. Thanks, Lisa- I hope you love them as much as I do! :) Thanks for the party invitation- I will be there! yummm! I love oatmeal cookies, going to have to try these! Thank you for spreading JOY and sharing at the Oh What a HAPPY Day party. Angela, I hope you like them as much as we do! :) I enjoyed my visit to your blog, and am happy to be following you back! Thank you so much for coming by! Hi Joy! Thanks for bringing these cookies to the #CakeFriday Coffee Klatch and spreading the word on twitter! Have a great weekend!! These are delicious cookies! I substituted chocolate chips for the raisins and increased the salt to 1 tsp. Thanks so much for sharing. I am always looking for a great oatmeal cookie recipe and have never really found one but this looks like it will be "the one". Crispy on the edges and soft in the middle is exactly what I am looking for. Pinning to my cooking bucket list! I think I also need some buffalo tallow because I have tried everything else with no good results! Thank you for sharing on the Easy Life Vintage Series. Delicious cookies, thanks for sharing with Hearth and soul blog hop, pinning.